MM is a new on-line book club that is hosted by Rosemarie. Visit and join us. 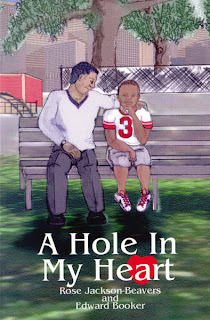 The first book club selection is A Hole in My Heart by Rose Jackson-Beavers and then 14-year old Edward Booker. 1. Adrienne started off as a loving mother. Do you feel that having a baby while suffering from depression was a good thing for her? Her parents thoughts so. What do you think? 2. Adrienne tried to commit suicide twice; do you feel that having a baby diminish her depression? 3. When Adrienne stopped doting on her children did you feel her depression returned? 1. As Darrius aged he begins to wonder about his father. Why is this a concern now? 2. Darrius wanted to talk to his mother about who his father was, but she was high most of the time. This made him very sad. It seems that age 13 is a crucial time in a boys’ life, why is communication so important? 3. Was Adrienne abusive to her son? 4. Why did Darrius have such a strong connection with his aunt? 5. Once Darrius and his sister Jacqui moved in with their grandmother due to Adrienne’s neglect and drug usage, should she still have the right to be in her children’s life?